The abundance of water resources in the Pazardzhik Region has helped it develop. The Batashki Vodnosilov Pat hydrocomplex harnesses the Topolnitsa and Luda Yana rivers, provides energy for copper mining, pharmaceuticals, timber, paper, textile, food processing, and agricultural industries. 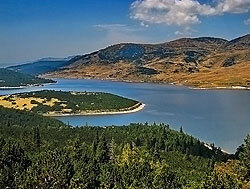 In the south, the Rhodope mountain slopes are alive with dense foliage, and dotted with artificial lakes. The shores of Batak Dam reservoir are home to two resorts, Tsigov Chark, and Saint Konstantin, and also many villas and shrines. The hilly countryside has the ruins of an ancient basilica (near the town of Belovo), as well as medieval fortresses in Tsepina, Bata, and Strelcha. Its name means “marketplace”, and Pazardzhik is certainly a shopper’s delight. The town has several shopping areas with markets and stalls. With its layout and the region’s kind, continental-Mediterranean climate, Pazardzhik is conducive to walking as well. Long pedestrian strets crisscross the town, meeting at an intersection. In the spring and summer especially, Pazardzhik’s outdoor cafés get a lot of business from residents and toursists strolling around town. One of the town’s few landmarks is the Church of the Theotokos, a national monument that houses several icons and religious wood carvings. To Bulgarians, the municipality of Batak is most known as the site of a massacre in 1876 which ultimately led to the country’s liberation from the Ottoman Empire. The Batak Historical Museum in the middle of Liberation Square documents and preserves items from the event and is a must-see for visitors to Batak. The municipality itself is surrounded by mountains and beautiful pine forests—in fact, 90% of it is forest. Batak is large, but sparsely populated. The Batak Dam is a big draw for both tourists and environmentalists. The artificial lake it created has a power plant and a bird sanctuary. It is part of the European Union’s Natura 2000 network of protected ecological sites. There are two resorts on the lakeshore: Tsigov Chark and Saint Konstantin, and several villas.